Royal Bermuda Regiment divers will this weekend spearhead a lionfish derby designed to take out as many of the invasive predators as possible. 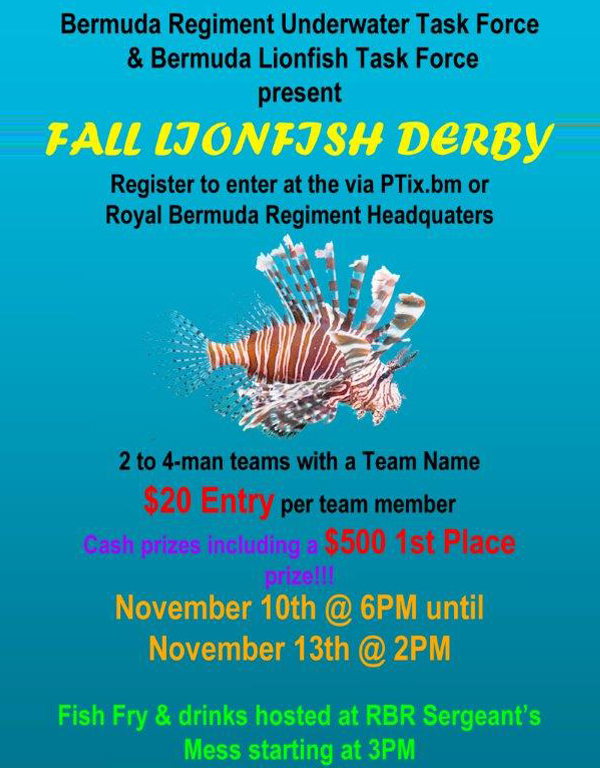 The RBR Underwater Task Force has teamed up with the Bermuda Lionfish Task Force for a team competition to help wipe out the fish, originally from the Pacific, that prey on native fish that keep the island’s reefs healthy. And prizes – including a $500 top prize – are on offer for teams of two to four divers who join in for the four-day event. RBR Lance Corporal Neville Vanderpool, part of the RBR dive squad, said: “We’re trying to get as many bodies in the water as we can to eliminate some of the lionfish out there. “It’s very important for our reefs – lionfish literally eat everything in sight. Algae grows on the reef and native fish eat the algae. Lionfish eat the native species and if the algae grows on the reef unchecked, the reef dies. The event starts at 6pm on Friday and runs to 2pm on Monday. The cost is $20 a diver and the derby will end with a weigh-in and fish fry and drinks at 3pm on Monday at the RBR Sergeants’ Mess at Warwick Camp. Divers can register at PTix.bm or by contacting L/Cpl Vanderpool on 799 0810.